Located in the Mott Haven section of the Bronx, Gun Hill Tavern offers 8 draft lines of Gun Hill beer + cans of NYS beer & cider, NY spirits, NY wine, and an upscale pub dining experience. Gun Hill Tavern opened in November 2016 and is conveniently located near the Willis Avenue Bridge, the RFK Bridge, and just one stop on the #6 train from Manhattan. Gun Hill Tavern is now the second location under the Gun Hill umbrella, joining Gun Hill Brewing Company at 3227 Laconia Avenue in the Williamsbridge section of the Bronx. Come in to try some food or to sample any of our NY state made craft beverages 7 days a week. Gun Hill Brewing Co., the first production brewery in the Bronx since 1961, opened its doors in January 2014. The brewery’s co-founders, Kieran Farrell and Dave Lopez met on a baseball field in early 2004 playing on a men’s semi-pro baseball team, the New York City ThunderDogs. With New York City’s brewing revolution strongly focused in the borough of Brooklyn, Kieran and Dave decided to use their strong ties to the Bronx to expand some of that focus up north. 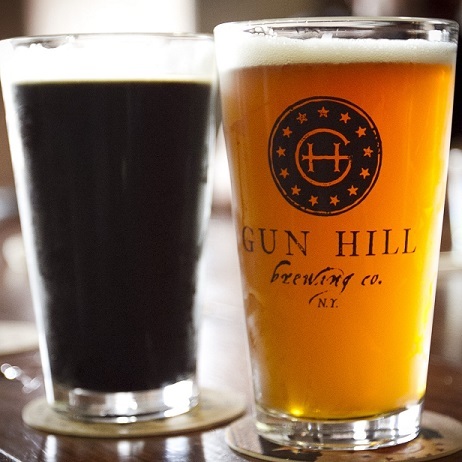 While Gun Hill lends its name to the brewery, the values and personality come from those colonists that dragged a cannon up a hill in defense of their ideals and forced a British army to turn on its heels. Gun Hill's beers are all crafted by brewmaster Chris Prout and assistant brewer Max Balkin at the brewery. Every Thursday is Public Server Appreciation Day starting at 3pm. TRIVIA NIGHT TUESDAYS: Every other Tuesday is free trivia night beginning at 8pm. Prizes to the winning teams include bar tabs, free drinks, merchandise, and more! Next Games are October 16th and October 30th. GAME NIGHT 10/24, 7-11pm. Let’s All Build presents a special trivia and casual games. Come by and hang out! #Inktobeerfest 11/1/2018, 6-8pm: The BX Arts Factory is teaming up w/ GunHillTavern to bring you #inktobeerfest. ***Extended Happy Hour for the participants from 6 to 8pm 11/1/18*** Go to http://www.bxartsfactory.org/ for more information! Book Your Party at GH TAVERN! Contact us to reserve space!